A view from 47th St. of the rear of the Luxor Hotel with its Luxor Health Club, also known as Luxor Baths, Luxor Gym Club, Luxor Health Institute, and Luxor Men's Health Institute. This business was located here from 1925 to 1980. Polk's 1933-34 New York City Directory listed David Podolsky, Hyman Lindenblatt, and Louis Rotkowitz as officers in the Luxor Hotel & Baths Corp. at 121 W. 46th St. The building at 121-127 W. 46th St. was a 9-story brick building constructed in 1924/25, and it operated from its inception as the Luxor Hotel / Luxor Baths until it was demolished in the late 1980s. Plans for a 14-story hotel and Turkish baths building were filed with the New York City Dept. of Buildings in 1924. The owner on the building permit was P. D. R. Construction Co., David Podolsky, president. David Podolsky (1870-1945), an immigrant from Vilna, Lithuania in 1896, is listed as a real estate and insurance agent in New York from 1910 until the late 1920s when he became associated with the Luxor Baths. He was a prominent leader in Zionism, and his obituary, New York Times, 23 Dec. 1945, read in part: "David Podolsky, a pioneer in the Zionist movement, who was president of the Luxor Hotel and Baths, 121 West Forty-sixth Street, died yesterday morning at his home, 6 West Seventy-seventh Street. Born in Vilna, Russia, seventy-three years ago, he was a graduate of the Vilna Yeshiva. In 1896, the year he came to the United States, Mr. Podolsky helped form the Chovevei Zion, the original Zionist group. ... Since 1900 he had been in the real estate business in this city." A notice in the New York Times, 23 Dec. 1945, noted: "The staff of the Luxor Hotel sincerely regrets the passing of our President, David Podolsky, and extends deep and heartfelt sympathy to the bereaved family." Other members of the P. D. R. Construction Co. that built the Luxor were probably Louis Druskin (1875-1928) and Israel Rotkowitz (1871-1937). Louis Druskin came from a family of physicians and as early as 1913 was co-proprietor with Hyman Lindenblatt of the Forsyth Baths located at 79 Forsyth St. An interesting document in Louis Druskin's life is a passport application made in 1921 when Druskin was traveling to Europe as a representative of Radiosoul Films Inc. Radiosoul Films were a film production company, and a letter attached to the passport application states that Druskin was "duly charged and authorized to proceed to Poland for and in behalf of the Radiosoul Films to sell and to purchase feature photo-plays, and particularly to arrange with local talents for the filming of those scenes of our scenario, 'The Informer', which require settings of life of the former Jewish pale." Louis Rotkowitz (1868-1924?) was listed as treasurer at Luxor Hotel & Baths Corp. in Polk's New York City Directory 1933-34, but this is probably an error and should be his brother, Israel Rotkowitz (1871-1937). Israel and Louis Rotkowitz were owners of the Rotkowitz Bros. pharmacy located at 165 Stanton St. from the early 1900s. Louis Rotkowitz seems to have died in 1924, prior to the formation of Luxor Hotel & Baths, while listings from 1931 through 1937 associate Israel Rotkowitz with Luxor Baths. Israel Rotkowitz was born in Russia and his naturalization petition dated 4 Oct. 1897 says that he was born 5 July 1871 and arrived in the U. S. 20 March 1892. Another major figure at Luxor Baths was Hyman Lindenblatt (1880-1948). Lindenblatt was a brother-in-law of Louis Druskin and lived with the Druskin family at 214 East Broadway in 1910. At that time he was an owner at Forsyth Baths, 79 Forsyth St. He and Druskin were listed as original incorporators in the new incorporation statement for Luxor Baths Corp. in the New York Times, 23 Aug. 1924. Hyman Lindenblatt registered for the World War II draft in 1942, age 61, born 15 Oct. 1880, Vilna, Russia, when he lived at the Luxor Hotel, 121 W. 46th St. 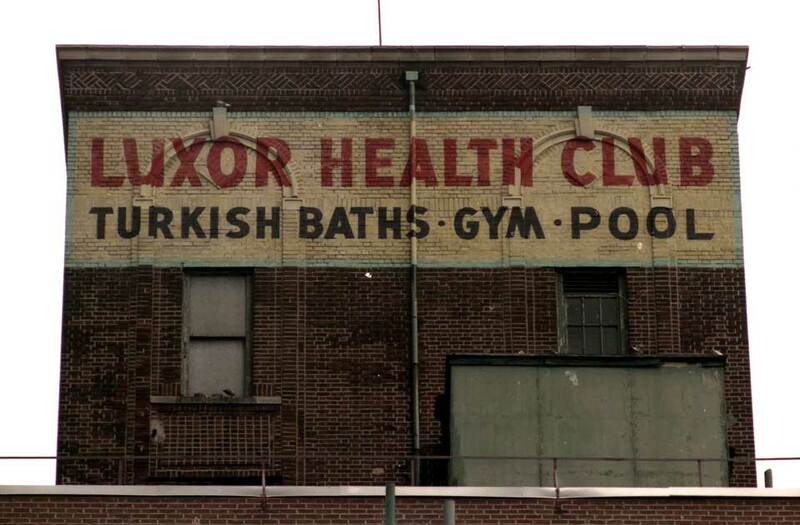 The Forsyth Baths at 79 Forsyth St. (between Hester St. and Grand St.) were in business from 1909 to 1927. Directories associated both Louis Druskin and Hyman Lindenblatt with its operation. All of the buildings on this, the west, side of Forsyth St. were demolished in the early 1930s when the Sara D. Roosevelt Park was constructed. The flickr site for the Boston Public Library has made available a postcard with several views of the Luxor. Getty Images includes a photo labeled "Men enjoying the Luxor Baths." A brief Wikipedia article can be found regarding the Luxor Hotel.